A typical restaurant salad is a work of visual art, for sure, but it’s often way too big. By the time you take into account the croutons, cheese and salad dressing, it’s not unheard of for a restaurant salad to reach 1000 calories or more! Here are some ways to modify that heavy weight and bring a salad down to what it should be – great nutritional fuel for your body. 1. Why not start by dividing the salad in half and taking the other half home? A simple fix to a large portion, not just for salads by the way, and then an opportunity to enjoy it a second time. 2. Asking for the dressing on the side allows you to control the amount you consume. Do you eat the salad for the dressing? More and more people simply skip the dressing; enjoying the flavor of each bite with no cover up. 3. Olive Oil and Vinegars make wonderful dressing and are usually available as an option one can self- serve. Commercial dressings are full of heavily processed oils, sugar, and preservatives, and are best avoided. 4. If you enjoy ranch-type salad dressings, consider using a Greek Yogurt ranch dressing instead of the heavy, oily traditional ranch. 5. Ditch the Croutons – they are no more than empty calories, added carbs, and are often made with those same unhealthy industrial oils. 6. Go for the best salad greens. One of the hidden pleasures of a salad is the anti-oxidant rich dark, green leafies such as kale, spinach, and romaine; nutrient rich, fuller in flavor, and supply more chewing satisfaction. In comparison, Iceberg lettuce is nutrient poor. 7. 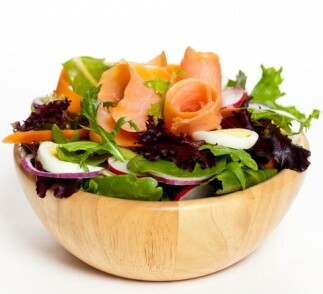 When salad is your entire meal, adding protein to the mix will give you a sense of being satiated and contented. Hard- boiled egg, water-packed tuna, or a chicken breast are all great options. 8. Sprinkle on some sunflower seeds, about 3 tablespoons of high energy, nutrient dense power food. Rich in Vitamin E, magnesium, B vitamins and fiber, they will add not just crunch to your salad, but also nutritional benefits. With just a few easy modifications, salads can become a powerful source of healthy energy – while still being delicious!